The Los Angeles Lakers did better than expected on a road game against the Portland Trail Blazers, although without Kobe Bryant, that is to be expected. They lost 98-94 due to another incredible Damian Lillard performance in the fourth quarter. Jeremy Lin was very good, especially in the fourth, but was once again ignored for too many minutes by Byron Scott. Whenever Kobe Bryant doesn’t play, resting as part of his and Scott’s plan to keep him fresh and efficient, it seems like there is a load lifted off of a lot of Lakers players. Bryant has been better at keeping his shots down in recent games, but the ball just moves a lot quicker when he’s out of action. Jordan Hill of all people thrived the most, leading the team with 23 points. The Lakers led for most of the way, but succumbed to a crazy performance by Lillard. Lin? Hes scored 14 points, nine of them coming in the fourth quarter. However, he played just 21 minutes, while Ronnie Price, who wasn’t all that bad this time, scored 11 points in 27 minutes to go with 8 assists. Lin was on the floor when it mattered, and yet it’s still baffling, especially in a game without Bryant which hurts Lin if they’re together on the floor but doesn’t bother Price who doesn’t mind standing and watching, waiting for a ball to come his way, to see Lin playing these limited minutes. Come to think of it, Lin wouldn’t have been playing so much if it wasn’t for Ronnie Price taking an elbow to the face and breaking his nose. That might be the only way for Lin to start getting the minutes he deserves to see. Lin did miss a 3-pointer that could have tied the game, air balling it in fact, but these things happen, and he did score a layup later on that made it a 3-point game again. Damian Lillard is in a league of his own right now when it comes to performances in the fourth quarter. Out of his 39 points, 16 came in the fourth quarter, and all of those 16 points in the final 5:12 of the game. He didn’t need a “clutch” game winner or buzzer beater, but being clutch isn’t just taking the last shot of the game. It’s about showing up and playing your best basketball when your team needs you the most. Lillard going off isn’t something the Lakers alone suffer from. When he gets hot, there’s not a lot that teams can do to stop him. But it was another example of just how bad the Lakers’ team defense is. 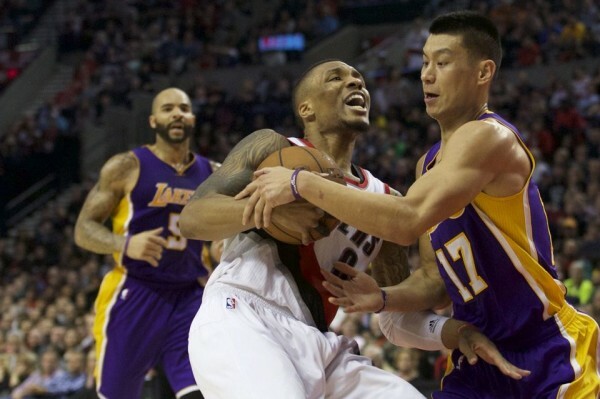 Jeremy Lin was guarding Lillard on a lot of those plays. Lillard didn’t blow by him. He kept getting screens and pick and roll opportunities. The Lakers don’t know what to do in that situation. Any time there’s a switch or back door screen along with simple P&R’s or pick and pops, the timing and order is so wrong it’s hard not to notice. Lin played good on ball defense against Lillard, but when the word help on this defense doesn’t exist, it’s hard actually stopping anyone, let alone one of the best point guards in the league. Byron Scott continues to confound us and a lot of others in his ability to keep Lin in a certain set of minutes regardless of what happens on the floor. His basketball instincts and ability to read what’s going on were never impressive, and the team seems average at best in almost every way possible when it comes to things a coach has influence on. Lin playing only 21 minutes? When Kobe Bryant isn’t even going to play? It might not be personal and simple being headstrong about a point he’s trying to make, but it’s not helping him or his team.